Next Confirmed Departure 17th October till 30th October. The trek to Everest Base Camp is one of the most famous treks in the Nepalese Himalaya's, why not join us for the experience of a lifetime and trek to Base Camp in 2017. 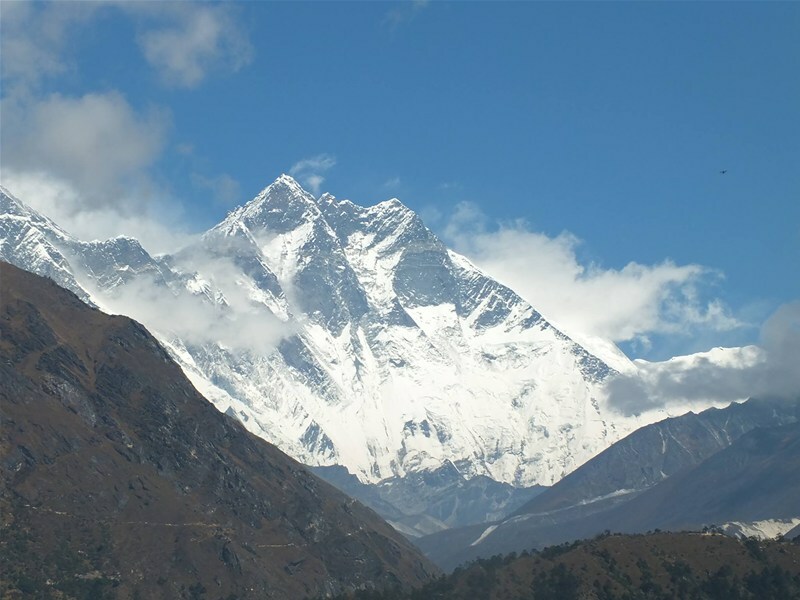 Join us in Nepal to trek to Everest Base Camp, one of the most iconic treks in the World. Departing from Kathmandu you will fly into Lukla Air Strip at an altitude of 2860m before trekking your way to an altitude of 5380m at Everest Base Camp. When you arrive in Nepal you will be picked up and taken to your hotelinKathmandu. Once you’re settled in you have the afternoon free to explore Kathmandu. There will also be a chance to change money and pick up any last-minute essentials. In the evening there will be a pre-trek briefing before dinner. After an early breakfast, we will set off the Kathmandu Airport, and our Twin Otter flight to Lukla. 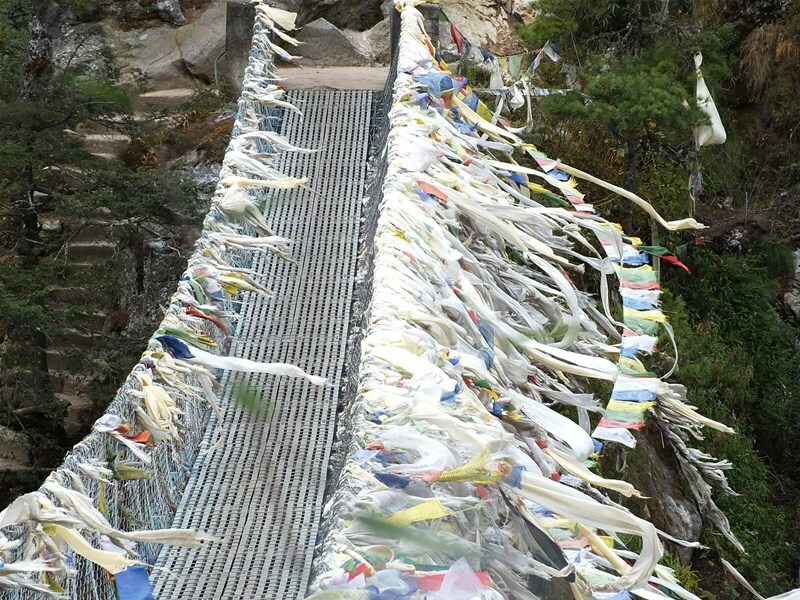 This vibrant town is the gateway to the Khumbu region- home of Everest. During the flight we may catch our first glimpse of Everest towering above the clouds. After landing, we will trek towards Phakding. 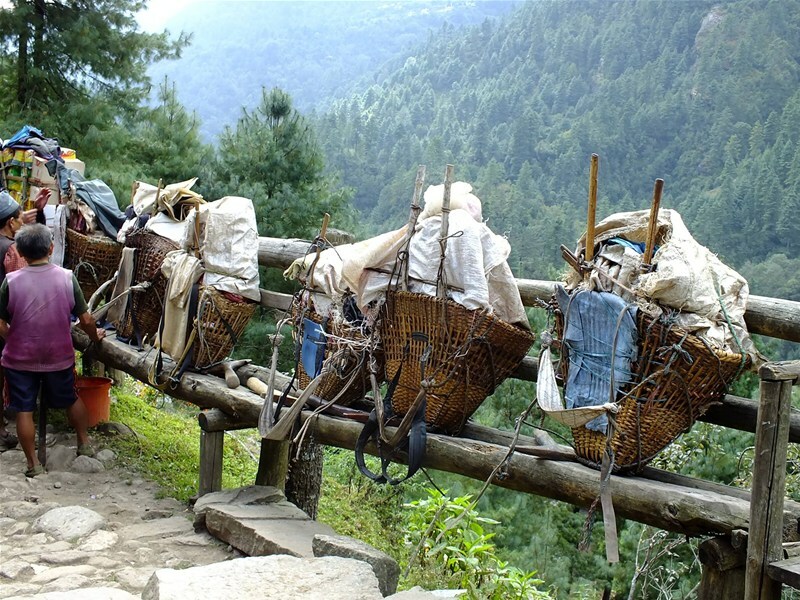 We will follow the course of Dudh Kosi river, along a centuries-old trading trail that runs from Nepal to Tibet. After passing the small hamlet of Thado Kosi, we will cross a small bridge and view the triple peaks of Kusum Kanagaru to the east. Following the cobbled trail, we will pass the village of Ghat and reach the lively village of Phaking. After breakfast, we will trek for 2 hours to reach Monjo, before continuing up the banks of the Dudh Kosi River, crossing it twice over small suspension bridges (not for the faint-hearted!). 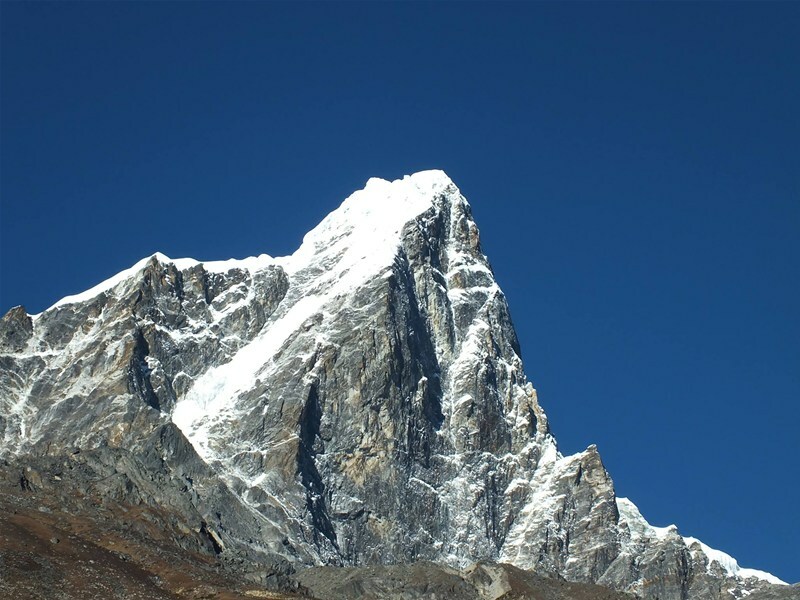 At Monjo we will enter Khumbu National Park. After crossing the river a few more times, we will have a steep climb through pine forests, to reach Namche Bazaar at 3440m. This prosperous trading town is the capital of the Khumbu Region, and home to a bustling market. 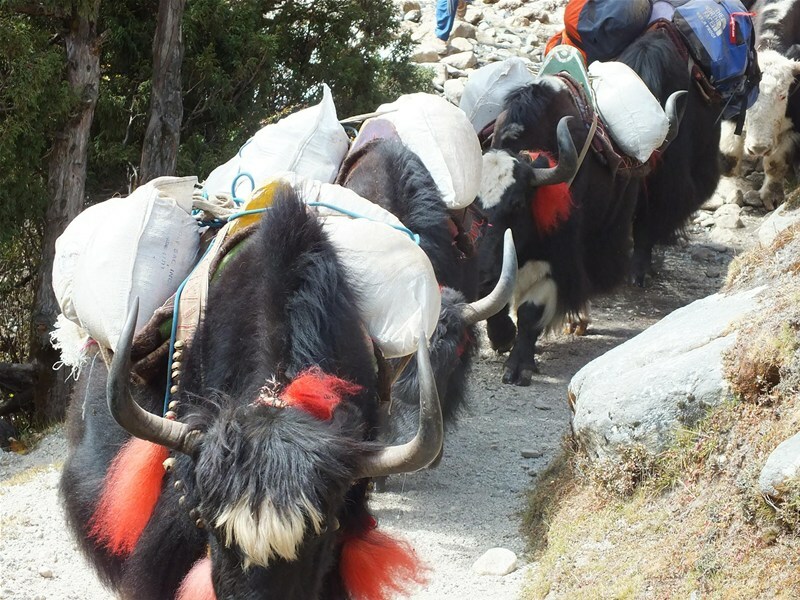 Many Tibetans will cross the border to reach Namche and trade their goods. From the village, you can view the majestic peaks of Thamserku and Kangtega- signposts that we are now entering Big Peak Country. Today we will rest and allow our bodies to acclimatise. In the morning, there will be the option to walk up to the Everest View Hotel (3900m), before returning to Namche for lunch. The tactic of walking high and sleeping low is one the most effective ways to acclimatise to the altitude. Once back in Namche, there are some nice bakeries which are renowned for their fresh apple pie where we can pick up a treat before watching the Himalayan sunset. 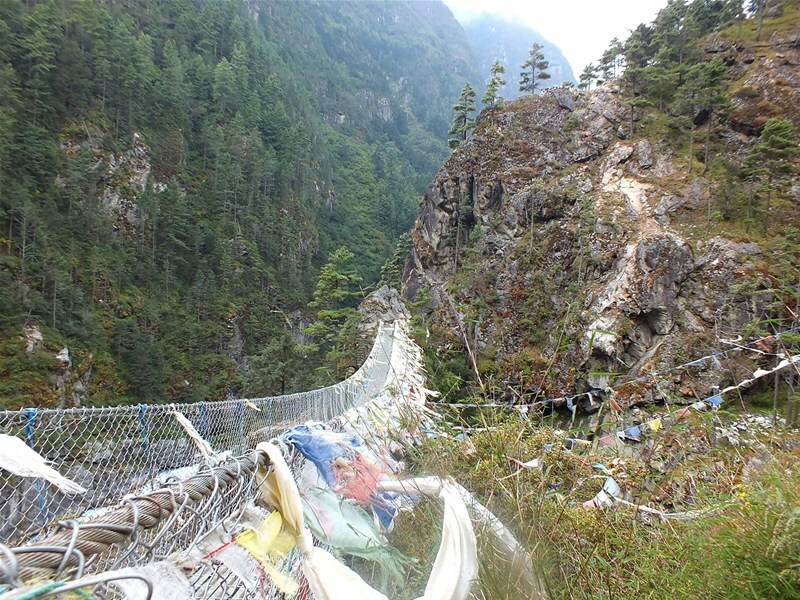 We will take the well-worn Everest Trail around the side of the valley from Namche. Far below us the Dudh Kosi river follows the valley floor. After a short trek we will get our first views of the imposing peaks of the Khumbu- Everest, Lhotse, Nupste & Ama Dablam. Our route today takes us through several small villages, and numerous tea shops. After crossing Dudh Kosi once more, we will make the steep climb towards Thyangboche. This village is home to an impressive monastery, which was recently rebuilt. There will be time to explore the town, and perhaps enjoy a little more fresh apple pie, before we retire to our guesthouse for the night. After leaving Thyangboche in the early morning we will follow the rhododendron-shaded trail, through Deboche, and across a suspension bridge. We will then come to Pangboche, a spot which affords some excellent views of Ama Dablam (Mother’s Charm Box), and which is also home to the Sherpas who work on the mountain after each monsoon season. We will then recross the valley and cross the river to follow the Imja Valley to the picturesque town of Dingboche. It’s another acclimatisation day before our ascent to the upper section of the Khumbu Valley. Today we will take a short walk up to Nangkartsang Peak (5072m) before heading back down for the night. Climb high, sleep low! We will return to Pheriche, before following the trail along the valley floor towards Dugla. Ahead of us we will see the trekking peak of Lobuche East (6116m), and to our left looms the formidable north face of Taweche. After three hours trekking we will reach the lodges and huts of Dugla at 4620m. From here we will follow the trail along the glacier moraine to the small collection of tea houses at Lobuche. Our afternoon here will be spent relaxing and adjusting to the increasing altitude. After breakfast we will trek for 3 hours to reach Gorak Shep. This was the site of the historic 1953 expedition’s base camp. At 5165m, the tiny village is surrounded on all sides by imposing peaks. After a stop in the village, we will continue to reach the modern-day base camp, where the groups ascending Everest depart. From here we will be rewarded with amazing views of the legendary Khumbu Ice Fall, and will spend some time exploring the camp before returning to Gorak Shep for dinner. Today we will touch the sky and reach the highest point of our trek at Kala Pattar (5545m). This climb will be hard work, and you will feel the effects of altitude on the way up. The effort is well worth it though, as from the summit you will be rewarded with breathtaking views of Mount Everest and the Khumbu Icefall, along with Lhotse, Nupste and Pumori above. We will then follow the trail back to Lobuche, and return down the Khumbu valley. After a stop in Dugla, we will push on to Pheriche. Following breakfast, we take the main Everest trail down a beautifully scenic valley, passing through Pangboche and crossing the Dudh Kosi before returning to Thyangboche monastery. A steep descent of 500m will take us through rhododendron bushes filled with birdsong, down to the river. After crossing via suspension bridge, we will climb the opposite valley wall to reach the path back to Namche Bazaar, where we will spend the night. Our trail flattens out today, and the rocky mountain trails are becoming a distant memory! We will cross the river twice, before making a shallow climb up a hill side to reach Lukla. We will feel the difference in altitudes and today’s trek will be a world away from the chilly heights of Everest Base Camp. We will take the time to soak up the atmosphere in each village we pass through, stopping at the occasional tea house for refreshments and small talk. We will spend the night in Lukla. We will catch an early morning flight back to Kathmandu. From the windows of our Twin Otter plane, we will catch our final glimpses of Everest and the mountains of the Khumbu. After transferring back to our hotel, the afternoon can be spent exploring Kathmandu- shopping and visiting the temples, or simply relaxing with a drink and some snacks in one of the lively bars in the Thamel district. Here you can mingle with fellow trekkers, and trade tales of the mountain. In the evening we will transfer to a restaurant in town for a celebratory dinner.